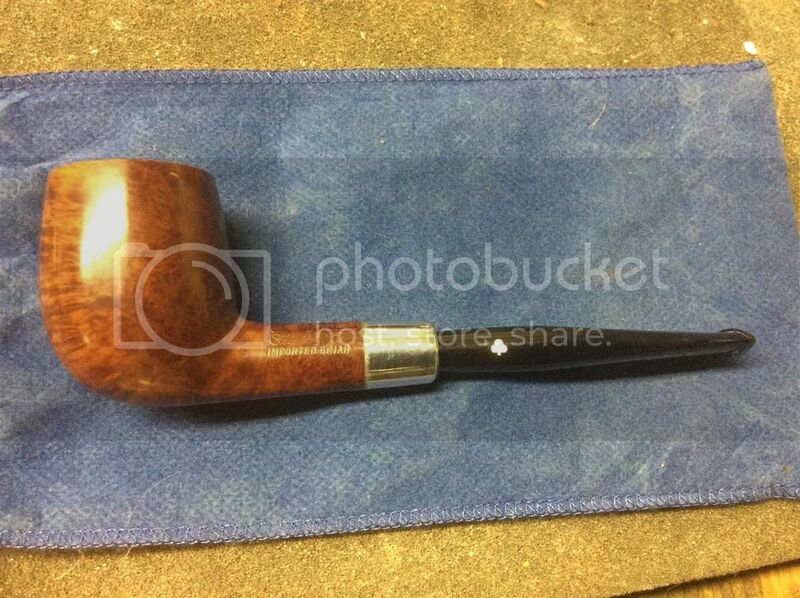 Restored a military mount style estate Kaywoodie today. Pipe was lightly smoked but grungy. This is an antique store find. Here is the before and after. Your clean up, as usual, is spectacular. What did you use on the bowl exterior? I used water and a tooth brush. Then rewaxed the bowl. Just that brightened it up that much. Nice job on that. I'll have to get my wife's tooth brush and try that technique. Toothbrush & water. No soap or other cleansers? Nice find! I always lose out on eBay with the KW Army mount pipes. Toothbrush, wax, and elbow grease. You don't need $400 worth of gear to make them bright. That is an inspiring example of Kaywoodie in its prime. Does it have a stinger? It looks like some of the elegant briars that go for hundreds these days. Pipes must not have been as popular in this area (central N.C.) since I seldom find pipes, much less good ones, in antique stores, flea markets, etc. On rare occasions, when I find something (nothing I want) the sellers know zero about them. There's just not much traffic in pipes. I think this was cigarette country. At the big state fairground flea market, I found some big gourd calabash pipes and the seller didn't even know what they were -- pipes was all he knew. They were still overpriced, and not something I am likely to smoke. 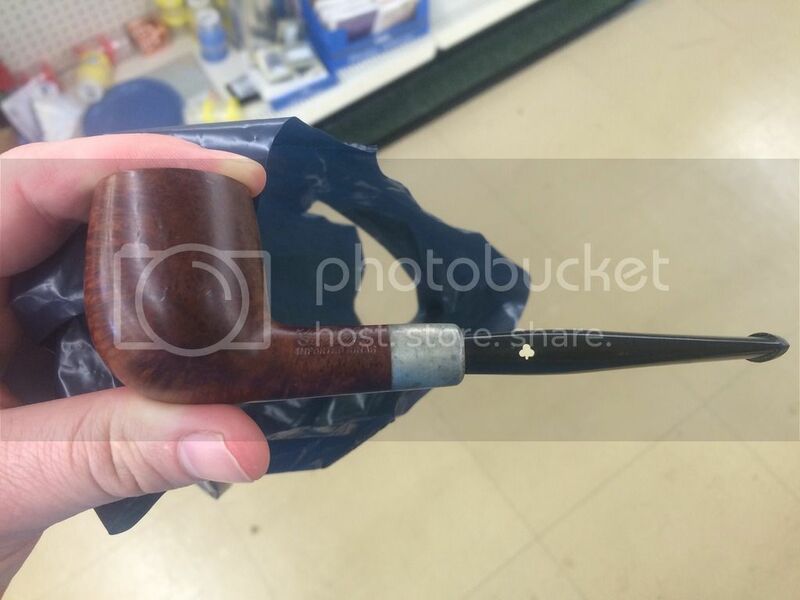 First Kaywoodie I've seen with a military mount. Cool find! Nice looking burner. Great job on that Dave! I've seen one or two of these on ebay before and was intrigued by their looks. I take it, it doesn't have a stinger? 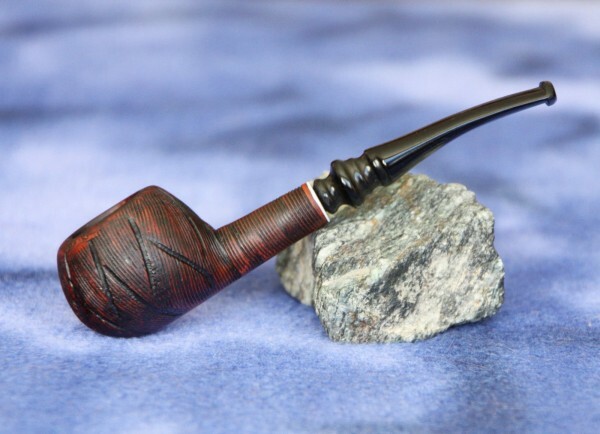 Very cool pipe! Enjoy! The lighting makes it look a different color but it is a lot brighter than it was. I just used water. I try to avoid using any kind of soap or chemical if I can help it so as to not mar the stain. I use spit to remove rim burn, but this pipe didn't have any. The stem is actually acrylic I believe as it had no xxidation. And there is no stinger. Not sure of the age of it. Anyone have any ideas? That pipe cleaned up quite nicely. Great job. Very nice work, she really shines and shows her true beauty now !!! Nice job! Love the look of those Kaywoodie army mounts and you did a great job on the metal. I've sharked after a few but never gotten one in my price range. Enjoy it! Cool old KW Dave ! It looks as though part of the nomenclature on the shank reads "Standard." If this is correct, then according to Richard Carleton Hacker (Ref. his book titled "Rare Smoke - The Ultimate Guide to Pipe Collecting") this model dates from 1950 to the present. Nicely done. That's a KW you don't see everyday. Nice work on that 'woodie! My hunch is that these were pipes made for PX sales to soldiers in the Vietnam War (possibly Korea). The stems are interesting. Some came with Perspex-like stems. The stems like the one yours may be nylon, but they are more prone to tooth marks than I would expect from nylon. On the subject of the stems, the Perspex-like stems should not be exposed to alcohol for any more time than it takes to run a cleaner through. I found that out while trying to clean up a particularly nasty Kaywoodie army mount. The airway was so gunky that my pipe cleaner became hopelessly stuck. I tried letting the exposed part of the cleaner wick Everclear up into the stem. The stem deformed and the pipe cleaner never came free. The stem was probably ruined anyway (it had hairline cracks near the button), but the alcohol sealed its fate. Nice work on an unusual KW! I love Kaywoodies and yours is a beauty. Great work as always, Dave. Got the one below for a song at eBay, because I didn't know what to make of it; part Kaywoodie and half restored, if you can call it that. But it still smokes great! The original stem was removed with the stinger, and replaced with this new stem. Strangest damn looking pipe I ever saw. It's now owned by the lady I'm trying to convert to the hobby.